Constructed of wood and bound in a leatherette material, the briefcase styled record player is lightweight and easily transported from place to place. It features built in stereo speakers so you can listen to your music without having to connect it to a sp.. These in-ear buds are ergonomically-shaped and compact to exclusively isolate noise so all you hear is sweet music. This represents a batch of inexpensive, colorful earbud earphones designed specially for the iPod Nano 5th generation and comes with three s..
Felix Weingartner - Sextet, Octet (Ensemble Acht, Treindl) (Musi..
Crosley Cr66-pa Rochester 5-in-1 Stereo Turntable Sound System -.. Whether you are in the mood for your favorite Sinatra album, your first U2 CD, or a little NPR, the Rochester has you covered. This spectacular unit comes complete with a 3 speed turntable, a programmable CD player, AM FM radio, and a side mounted cassette..
Crosley Cr44cd Turntable Console With Cd Player And Am/fm Tuner .. Lift the lid to spin records in three speeds, or pop in a CD and let the built in speakers take you back to a simpler time. 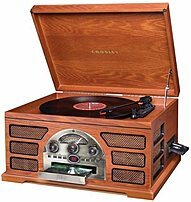 Crosley Cr8005a-dg Cruiser Adjustable 3-speed Portable Turntable..
Everard Cotes, was born December 22, 1861 in Brantford, Ontario. She attended Central School and later Brantford Collegiate Institute. She also attended the Toronto Normal School. She was the first female journalist to be employed full-time by the Toronto ..
Grammatica Do Chisena. A Grammar Of The Language Of The Lower Za..
Podge - The Pooiest, Ploppiest Pig on the Planet! Podge the pig''s belly turned others to jelly;It''s bottom-emissions were rotten and smelly!The pig often found himself in a foul mood, (Mainly because all he ate was junk food).His animal friends said enough was enough, And mutually agreed it was time to ..